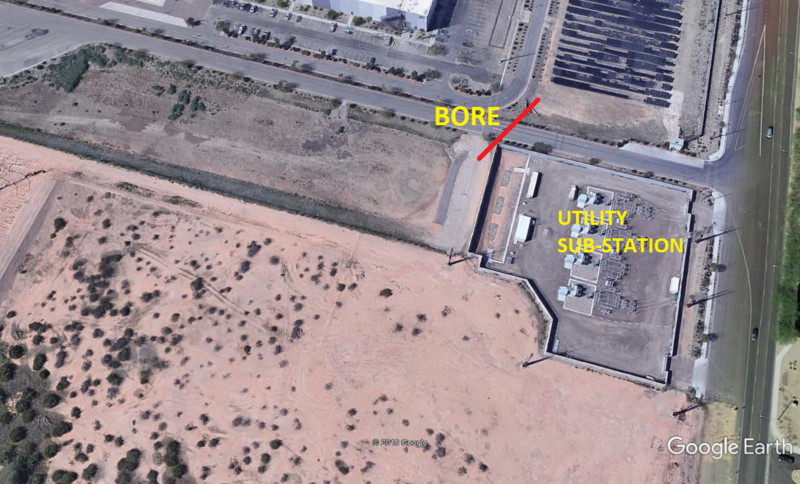 The contractor responsible for renovations at the new Apple data center, needed to install a new waterline to the facility, whose path crossed through the roadway and the underground conduits coming from the nearby Salt River Project’s (SRP) utility sub-station. Horizontal auger boring was the perfect trenchless construction method for this project, because it had no impact on the existing conduits running in the roadway. SSC’s expertise in Arizona soils made the company uniquely qualified for this project. SSC was contracted to horizontally auger bore 140’ under a major roadway, with 4 duct banks, to install a 12” waterline inside of a 36’ casing. SSC’s work on this project took less than 2 weeks to complete in total. “This was a fairly standard project for us, although we do take pride in working on large high profile projects like these for large companies”, says Arvid Veidmark III, Executive Vice President of SSC. Arvid mentions, “It’s always good for everyone involved when we can utilize trenchless technology, and help contractors avoid the costs and delays involved with relocating utilities.” Arvid adds, “It is really special, when we have the chance to work on utility infrastructure projects for large companies that improve local area communities”. 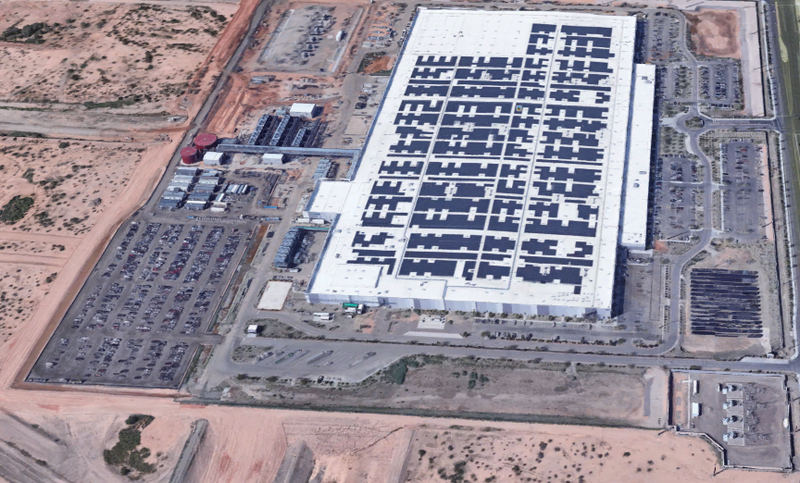 Apple is one of the most successful companies in the world and its decision to turn this 1.3 million-square-foot structure into its newest Global Command Center is a huge win for the state of Arizona. Apple will spend over $2 Billion dollars in development and renovations on this new datacenter site, making it one of the most technologically advanced sites in the world. The site will also be a model for sustainability, as it will run off 100% renewable solar energy, most of which will come from a new local solar farm they are developing. This facility will be the anchor tenant to the City of Mesa’s Elliot Road Tech Corridor. The City of Mesa has invested in roadway and waste water projects that should attract additional tenants. The SRP substation is an enormous benefit, as provides the significant power that high-tech company’s desire. This is one of the largest investments Apple has ever made, and it’s receiving a lot of attention from both the media and the public, as it brings more economic development to the region. The trenchless construction method that was used, is a critical piece of this project, as open-cutting the roadway would have led to significantly more construction work, as the utility lines from the newly constructed sub-station would have had to have been re-located. SSC was able to successfully complete the project on time, allowing the general contractor to continue working on other phases of this project, which will allow Apple to bring the site operational much sooner than if major utility relocation was required. Since 1969, Specialized Services Company (SSC) has been recognized as one of the top underground construction companies serving Arizona. SSC has become a leader in underground utility installations using horizontal auger boring, hand tunneling, and pipe ramming, as well as providing vacuum excavating and utility potholing services. SSC Boring places underground utilities in locations where it’s not practical or possible to use open cut. SSC’s subsurface utility engineering services can deliver a utility without open cutting a road, railway, canal, freeway or parking lot, through the application of trenchless technology.